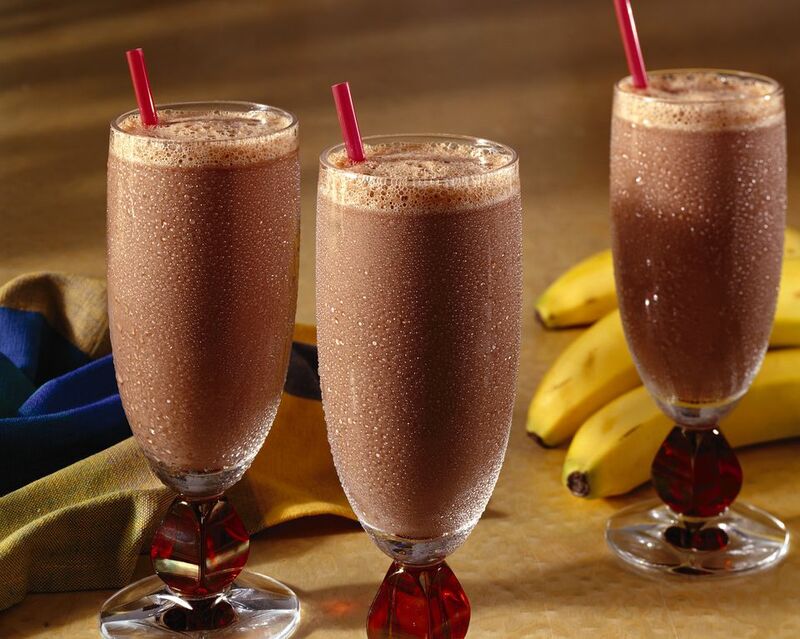 This chocolate banana smoothie recipe tastes just like a milkshake, yet it is far more nutritious. With a whopping 8 grams of protein, 5 grams of fiber and 29% of the recommended daily requirement for calcium, this chocolate banana smoothie makes a terrific healthy snack. Parents will also like the fact that it's cheaper than commercial smoothies and doesn't have any protein powders or additives. Place ice in the bottom of your blender. Use a handful or two, less if you want your smoothie to be more like a juice drink, more if you want it to be like a milkshake. Per serving: 259 calories, 5 g fat (3 g saturated fat), 2 mg cholesterol, 48 g carbohydrate, 5 g fiber, 8 g protein, 10% vitamin A, 20% vitamin C, 29% calcium, 9% iron.